Actress Kangana Ranaut, as the simple and lovable ‘Rani’, and Lisa Haydon, as the uninhibited ‘Vijaylakshmi’, have made a place for themselves in the audience’s hearts with the trailer and addictive songs of the recently released movie, Queen. The makers of Queen tried to inspire the same sentiment on the digital space as well, with applications and memes that established a personal connect with the film. Entire digital campaign revolved around the personality of Rani, Kangana’s character in the film. 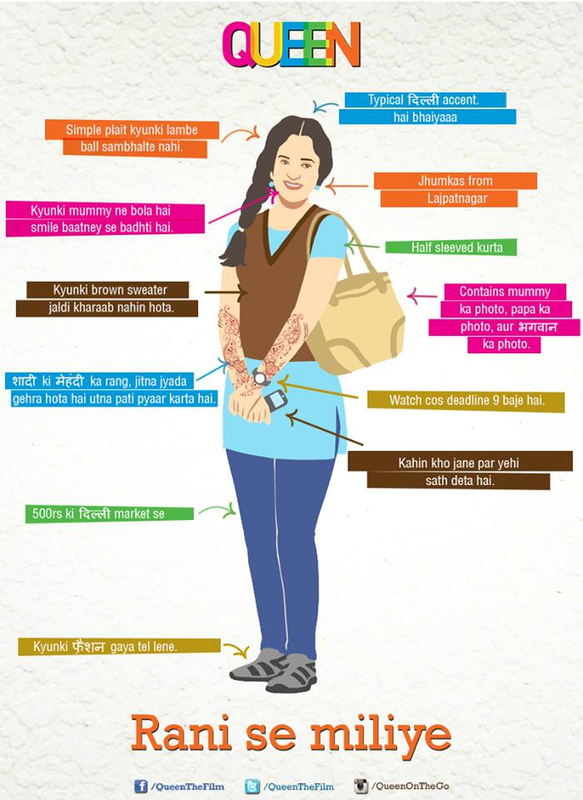 Her ‘India is best’ instinct and nervousness while travelling abroad all by herself come across via these campaigns as well. This made the audience understand what to expect from the film. 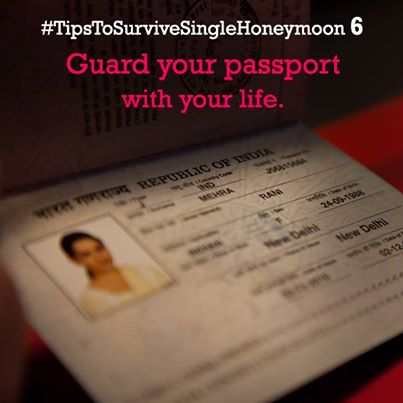 Hashtags like #AdvantagesOfBeingSolo, #HungamaDance, #SingleHoneymoon, #VijayLakshmiKeFundey, #TipsToSurviveSingleHoneymoon were used to engage audiences. 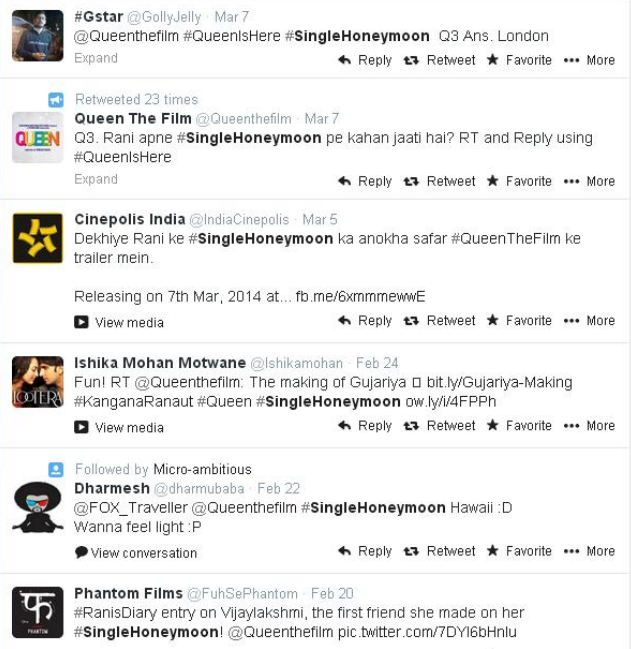 Pictures relevant to the theme of the movie were circulated with corresponding hashtags. Like the movie, the campaign was also centred around Rani to familiarise her with the audiences who hadn’t seen the movie or to strike up a conversation with those who already had! 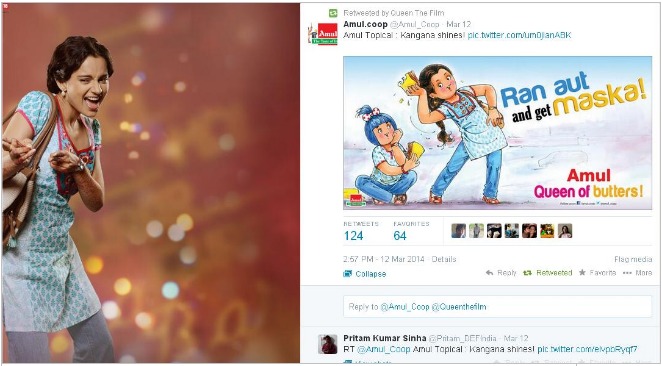 Amul’s applaud for the film was also spread across digital platform. Apart from Twitter, Facebook,YouTube and Instagram were also integrated in the campaign to reach out to people. Interesting and well thought out Facebook apps were created, which served their purpose and evoked the audience’s interest. The Phoren Name Generator app on Facebook helped followers to find out what their name may sound like in a different accent. 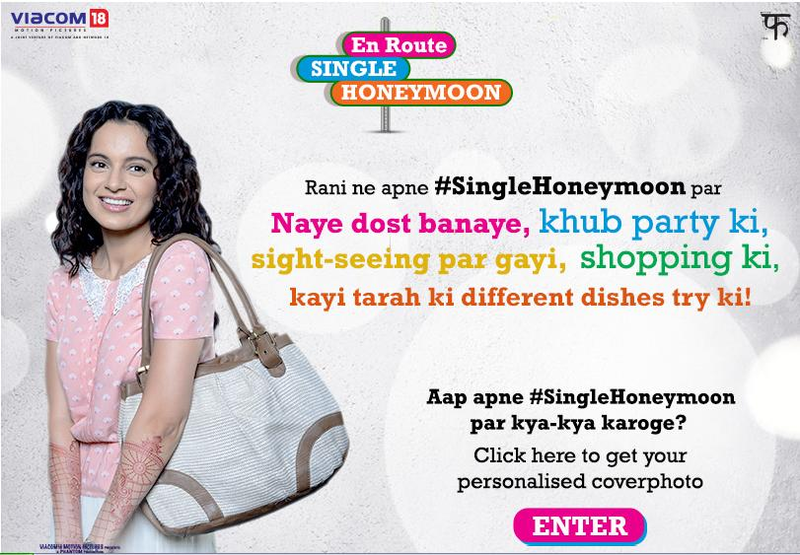 The En Route Single Honeymoon app on Facebook allowed users to select the holiday destination of their choice and generate a cover photo that depicts what is best in the selected destination along with the hashtag associated with the campaign. 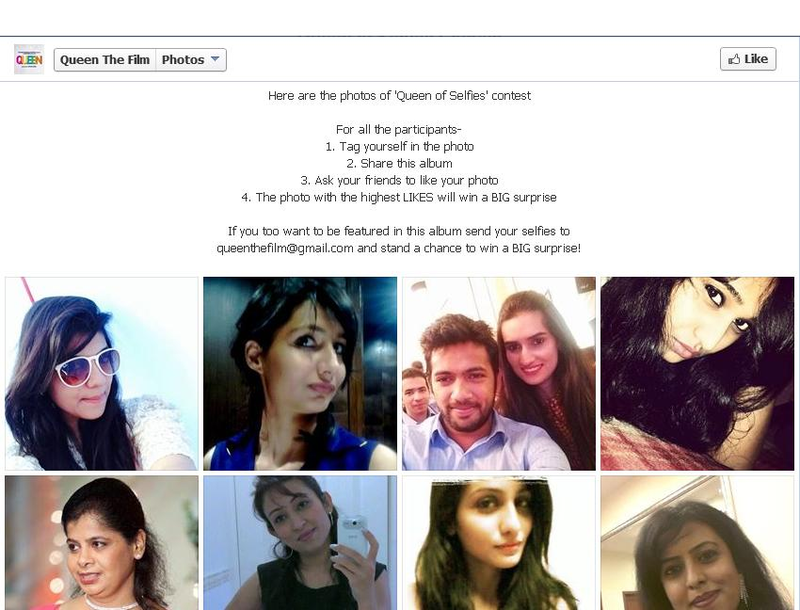 Apart from innovative apps, users were offered a makeover by winning a contest. The “Queen of Seflies” was started keeping in mind the current obsession with selfies in the virtual world. This increased the engagement with the audience and also hinted about the turn in the story of Rani as she underwent a makeover. 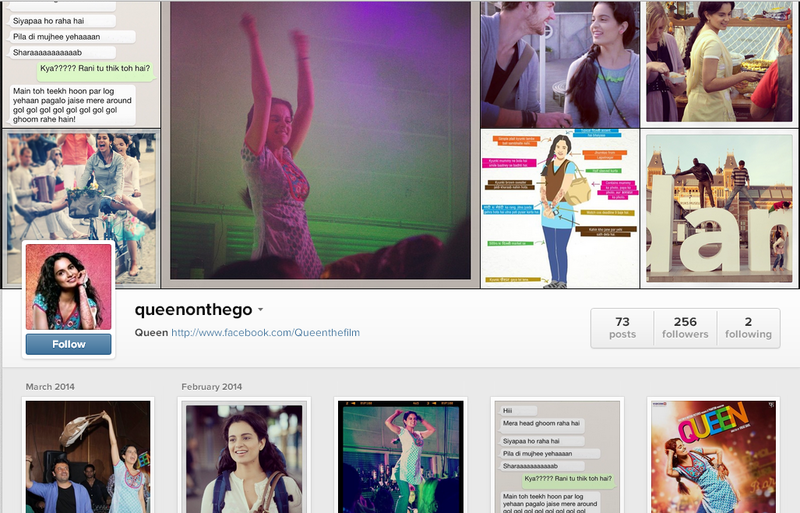 Not just Facebook and Twitter, upcoming platform of Instagram was also very well integrated in the entire campaign as @QueenOnTheGo, where images are being posted from Rani’s point of view, covering her journey from her wedding, to her single honeymoon experiences in Paris and Amsterdam. Apart from social media, promotion was carried out on mobile phones as well. International Women’s Day was incorporated as users were given the chance to chat with Rani on ‘WeChat’. All the platforms were very well integrated. Innovative apps and contests kept users engaged. Campaign was able to break into smart phone culture with Snapchat feature. Though the movie carries a strong message none of the platforms got preachy. All social media platforms were kept updated and maintained active participation with users. Like the movie,every digital activity was original and desiminated exact feel of the film. Platform like Pinterest, We Heart It etc. could have been incorporated as the movie and the character of Rani underwent a major makeover in the movie and the platform attracts many fashion followers. Apps like “Phoren Name Generator” were innovative but failed to actually give an apt phoren name. It just played upon the sounds in the name rather than giving Rani to Queen, Olekzander to Alexander to Sikander kind of names which the film had. A lot of movie based initiatives based on Rani’s cooking to Rani’s ‘Firsts’ like first trip abroad, first kiss and first car drive could have been played upon! The Instagram page failed to provide exclusive pictures. Initial posts were in sync with what it promised- pictures from Rani’s point of view but was not carried forward later. 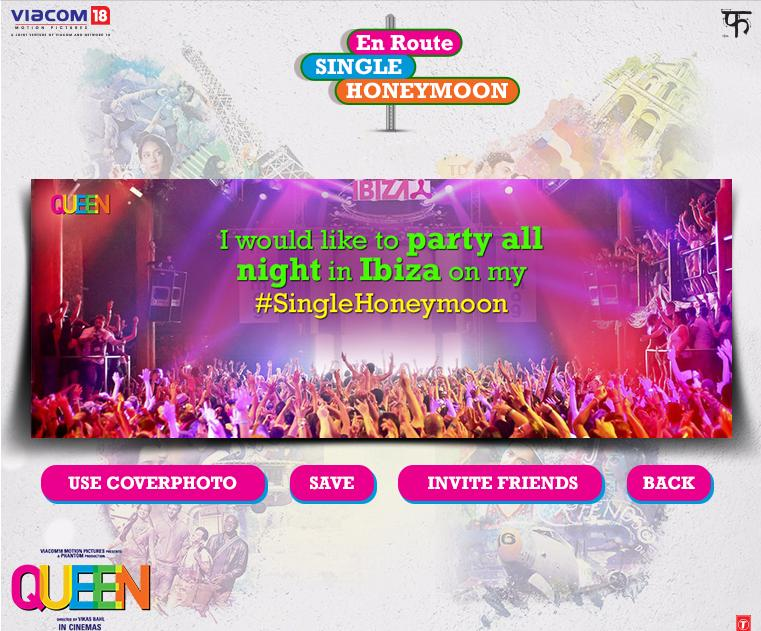 The entire campaign was very well integrated across all digital platforms and attracted great traffic. 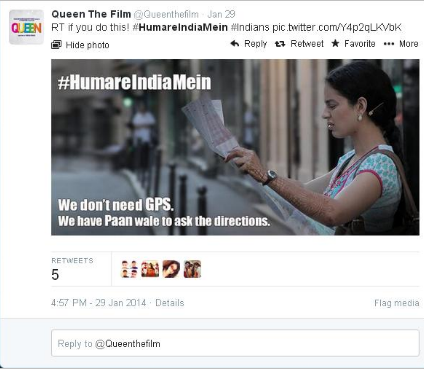 Both Facebook and Twitter pages were interactive and disseminated the correct spirit of the film.